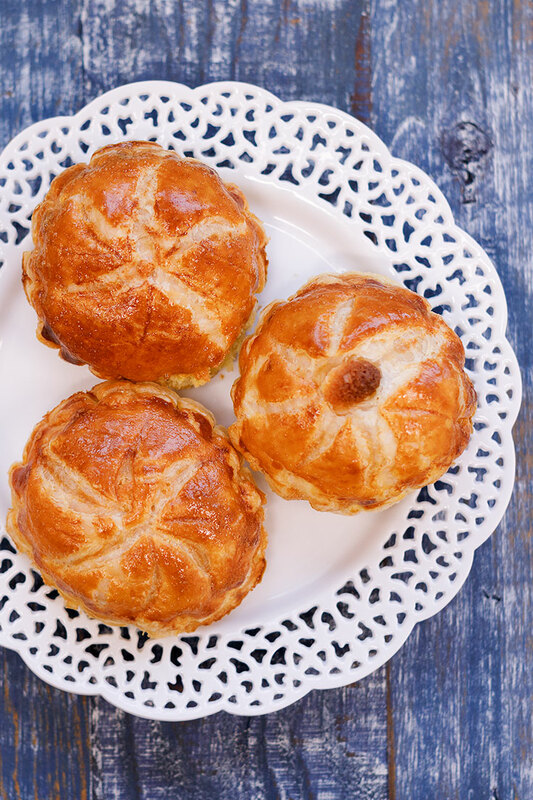 Pithiviers originated in the small French town of Pithivier. They are traditionally filled with frangipane or almond paste but can be made as a savory pastry as well. To make them even more beautiful, they may be egg washed before baking or brushed with simple syrup after. ½ tsp Amoretti® Almond Extract O.S. In a food processor, combine powdered sugar, Blanched Almond Flour and cornstarch. Mix for about 30 seconds. Pour mixture into mixing bowl, add butter and cream together, scraping bowl. Add eggs, Almond Extract, and Amaretto di Amoretti Liqueur Flambé. Mix to combine, about 2 minutes. On a lightly floured surface, roll out the sheets of puff pastry to rectangles about 12” x 16”. Using cookie cutters, cut out circles in the desired size, two for each Pithivier. Pipe a circle of Almond Cream inside the egg washed edges. For the top of the Pithivier, score the top circle with a small knife, making a fan-shaped pattern, beginning in the center and ending at the outer edge. Lay the top over the bottom covered with Almond Cream. Press to seal the edges. Press your finger on the sealed edge and, with a small knife, make a small curved cut towards the center, turning the Pithivier as you go, creating a design on the edge. Brush the top with egg wash and chill for 15 minutes. Brush with egg wash again and sprinkle with sugar. These are delicious with coffee and are best served warm.